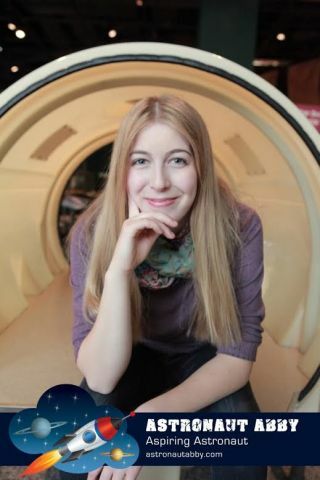 Abigail Harrison, also known as Astronaut Abby, is a public speaker and undergraduate studying astrobiology with the hopes of someday traveling to space. By aiming for Mars, 21-year-old Abigail Harrison hopes to inspire young women on Earth to pursue their own dreams. Harrison, also known as Astronaut Abby, serves as an advocate for STEM (science, technology, engineering and math) and has been publicly aspiring to be the first person to visit Mars since she was 13 years old. Ahead of National STEM Day (Nov. 8), she talked with Space.com about college life, role models and, as she put it, dipping one's feet into the solar system. She is currently studying astrobiology and Russian as an undergraduate. This past summer she worked in the Schuerger Lab at the Space Life Sciences Lab at NASA's Kennedy Space Center in Florida. She studied bacteria that could live under extreme conditions to understand how scientists might avoid contaminating Mars, as well as how they might effectively search for life beyond Earth. For one, she transferred to find a better educational fit. After spending two years at the University of Minnesota, she left the big school. Harrison said she wanted to shift to a smaller institution to get more one-on-one experience in the classroom. Harrison said she would "hands down" choose to repeat that decision. Her college experience also fortified her passion for STEAM, Harrison said — not just STEM. The "A" stands for "arts." "Teaching liberal arts in conjunction with STEM is important … it helps us to be able to connect what we're doing," so that lessons set students up for the full scope of a STEM career, Harrison said. She said that it's important for liberal arts colleges and STEM-focused schools to foster "integration" of the expressive arts into science, technology and engineering studies. Former astronaut Mae Jemison made a deep impression on Harrison when the two met in September of this year. "Meeting her was this incredibly inspiring experience," Harrison said. During the launch of the "Defying Gravity: Microsoft HoloLens Women in Space" exhibit at the Intrepid Sea, Air & Space Museum in New York, Harrison watched Jemison, the first black woman astronaut, talk about the history of female space travelers. "Dr. Jemison is this incredible woman who has a lot of passion and knowledge," Harrison said. Along her journey, Harrison's biggest surprise was learning that messing up is part of the process in STEM, she said. "We're all going to fail," she said. "That sounds terrible, doesn't it?" Harrison clarified that the idea isn't that an eager STEM student will fail overall, "but you'll hit a wall, and it'll be too much for you at the time. "For women, it's especially hard. We get told that messing up is the worst thing that could happen and that [it] means we haven't succeeded ... but you have to fail," Harrison said. "It allows you to grow." Having dreamed of reaching Mars since she was a kid, Harrison said her enthusiasm for space exploration is more nuanced now. In addition to the endeavor's undeniable cool factor, Harrison said she also now appreciates that exploration is fundamental to human nature and can produce new scientific by-products in space engineering and other fields. "Dipping our toes in the solar system," she said, can inspire an entire generation to learn more about the world.